Narragansett Turkeys are a cross between eastern American wild turkeys and domestic turkeys. They are unique to North America and are named for Narragansett Bay, Rhode Island, US. They are raised for commercial agriculture across the United States. 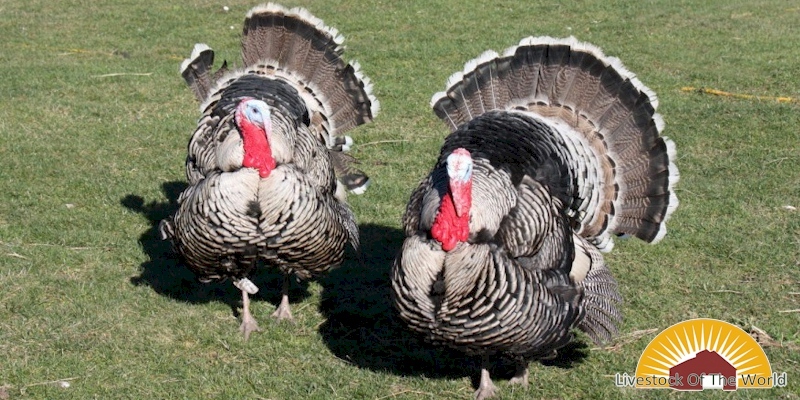 They are the foundation of the turkey industry in New England, US, and are especially important in Rhode Island and Connecticut. They are also popular in the Mid-Atlantic States and the Midwest. Narragansett Turkeys have black, gray, tan, and white feathers. Sometimes they have bars of white feathers on their wings due to a genetic mutation not found outside the United States. They have a black beard, a horn-colored beak, and a mostly featherless head and neck which range in color from red to blueish white. They have an excellent temperament, calm disposition, and good maternal instincts. They mature early, are good egg producers, have excellent quality meat, and won’t wander far when the free range. The toms weigh 22-28 pounds and hens weigh 12-16 pounds. They can run quickly, fly well, and prefer to roost in trees. They are good at foraging for crickets, grasshoppers and other insects, and can be maintained with little supplemental feed. Really, these are great birds!